There are a lot of places throughout the world that are ideal places to camp. However, some of those places are not easy to drive to. For instance, you may want to camp deep in the woods, at the base of a mountain, or on the top of a hill. To do so, packs and supplies that are light are an option that makes the most sense. It isn’t ideal to be carrying around heavy gear in your backpack because you may overexert yourself. A good piece of equipment to have for these purposes is a backpacking tent. 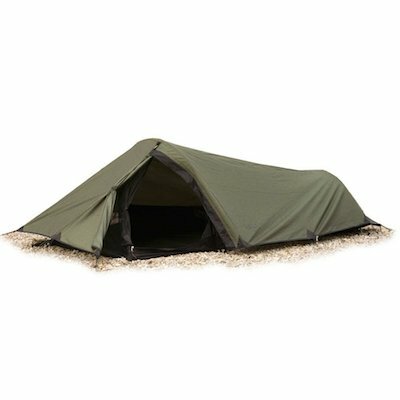 This type of tent is light enough to put in your backpack or bug out bag, so you can have it any time you want or need to camp out in the spur of a moment. It is also the type of thing that you can keep on hand even if you don’t plan on using it so that you will have it in a pinch or emergency. When searching for this type of tent, it is important to look for something that is ideal for 1 to 2 people, is sturdy, easy to put up and take down, and folds up nicely. Here are a few great options to choose from. 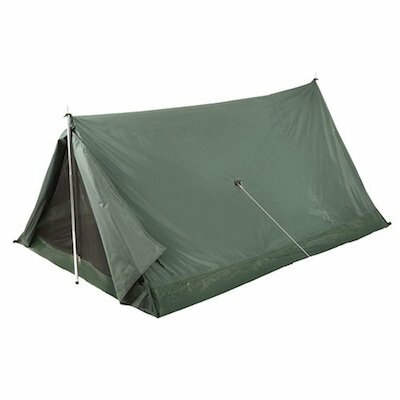 This tent is dark green in color and is reminiscent of a classic A-frame model. 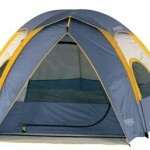 It is a two-person tent that is great for three seasons and is made of nylon. The design includes mesh doors, which keep out a variety of bugs. It is also flame retardant and features lightweight aluminum poles. It is very inexpensive. 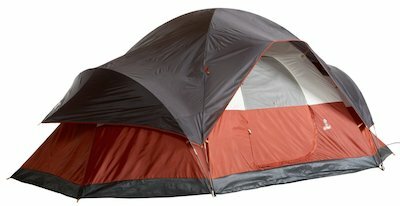 This tent may not be ideal for two people, but with its low price, you would easily be able to afford more than one if you wanted. It is a great deal because it seals up tight and is relatively waterproof. Furthermore, the pole at the entrance may seem like a headache, but it offers great support to the tent and keeps animals or people from being able to just walk in uninvited. This bivy-style tent is a drab olive in color and looks like it means business. It is used by many active and former servicemen and is well-built. The item is low to the ground and fits one person and a pack. Other features are venting at the feet area and a repair kit that is included, in case you run into any issues with tearing. This one-person solution has a hefty price tag, but it is also built to endure. It is waterproof and keeps bugs away from you. It is also good to use on nearly any terrain and can be covered up and hidden with ease. Although it may be hard to get into, it is great for even tall men or women. 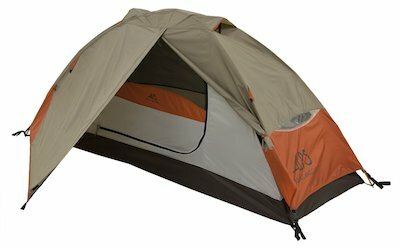 This product is a one-person tent that has a lot of extras. There is a removable rain fly, which adds extra vestibule space set on a freestanding design. The tent is constructed of polyester taffeta, a material that resists damage due to UV rays. This tent is a great deal. It has a price that doesn’t break the bank and has features that will extend the life of the item. For instance, the vestibule is a great place to keep your pack, where it won’t take up your living space but can still be secure from the wind and elements. It is rated for three seasons but can also be used in light snow or mildly cold temperatures in a pinch. When you are looking for backpacking tents, it is nice to have more than just basic solutions. It’s the little things in life that make it more awesome, so it is a good idea to do a little research and not buy the simplest or cheapest thing you can find. Each of these tents offers a little something extra for the serious backpacker. For the camper on a budget, the StanSport Scout Backpack Tent cannot be beaten. At less than 30 dollars, not only can you buy as many as you want, but you can also replace it easily if you have to. It is a classic looking tent that is super easy to assemble and is great at keeping bugs out. Additionally, it offers great protection from the wind and rain. For the camper that is looking for the most authentic experience, check out the Snugpak Ionosphere. It is used by military men and women, so you know that it isn’t a cheaply-made product. It looks like a green cocoon on the ground and offers little room for more than sleeping. However, since it is so low profile, it keeps the person inside protected from the weather and things that creep around at night. If a freestanding tent is your thing, the ALPS Mountaineering Lynx is a great product to use. Not only does it keep snow and wind out, but it also protects itself from radiation. There is also plenty of storage in it, and you can remove the top in order to see the stars or ventilate the tent on hot summer nights. The price is reasonable for this modest sized item, and it can be used on many endeavors outdoors. Welcome to Wildgetaway.com - home for all your camping, bushcraft and survival equipment needs. What is the brightest flashlight | AAA, AA, 18650, CR123A? © Copyright - Wild Getaway | Some recommended products may use affiliate links. wildgetaway.com is a participant in the Amazon Services LLC Associates Program, an affiliate advertising program designed to provide a means for sites to earn advertising fees by advertising and linking to Amazon.com.